Soar through the air from tree to tree and experience the thrill of a professional zip lining adventure tour at one of the Canopy Adventure Experiences in Riviera Nayarit Mexico! No experience necessary! Canopy zip lining is a safe ecotourism adventure activity that is truly eco friendly, allowing you to explore (with minimal impact) Mexico’s emerald green Pacific Coast rainforests in the foothills of the Sierra Madre Mountains. Zip lining with Canopy Adventure Park is one of the most popular Rivera Nayarit adventures you can do. You can book zip lining anywhere along the 200-mile stretch of Nayarit in most major communities like Nuevo Vallarta, Punta Mita, and Sayulita. Zip lines are gravity fed and since the length of the zip lines will vary, so too will the amount of decent and how fast the zip line goes! Come experience the exhilarating feeling of soaring through the natural tropical rainforests of Mexico over spectacular natural creeks and landscapes. Get close to nature from the ground…and from the forest canopy (a bird’s eye view). Canopy Adventure Experience has some of the longest and highest zip lines in all of Mexico providing visitors and locals with the thrill of a lifetime. All zip lining and adventure activities are 100% optional. You can watch our Youtube video on zip lining adventure tours in Riviera Nayarit. Visit our Land Activities page to explore other incredible Riviera Nayarit adventures including Outdoor Rappelling Adventures and Sierra Madre Off Road Vacations. Nayarit zip line adventures have been designed to be fun for all types of people and you choose what you wish to participate in. Whether you are the adventurous thrill seeking type or you just love to experience nature, zip lining in Mexico is an unforgettable adventure. Feel your adrenaline kick in! Drink in the sights, sounds, and smells of Nayarit’s amazing natural rainforests! 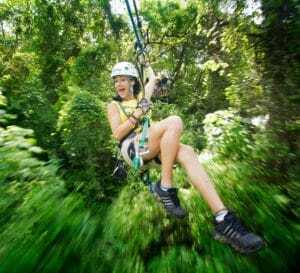 Experience the rush of canopy zip lining in Mexico Riviera Nayarit!